Strange spectrum is not QE but QExFF. Fill factor is all the way <1, so it means that QE>90% at 400nm. Another strange thing is the cut-off at the level of 30% in UV part of spectrum. What is happened at shorter wavelengths? The data is not complete and suspicious. This is a BSI sensor, FF always =1. so at 400nm, QE*FF=90% is very much possible. Actually, if the epi thickness is extend further, the QE*FF can reach 80-90% almost across the whole 400nm-800nm range. This is also very realistic, look at E2V BSI CCDs. We can only test till 250nm with our equipment. This is our characterization limit, not incomplete. Test further down to UV side requires different light source, and possible vacuum system, not easy to do! Come on! FF=1 is for ideal surface only. Even if one uses the gapless ML and ideal walls between CFA pixels, it is no chance to collect 100% incident photons. Reflections, refractions on many surfaces and stray lights... Agree, it could be very close to unit but all the way <1. QE has to be used itself without any add-on. Why UV part is suspicious? To measure correctly in this range, one has to calibrate photodetector (e.g. Si-PD) and use AR coated quartz optics or mirror optics. Far away it is not only a proper UV light source. This range is out of VIS and requires some effort to get the right data. Generally, your achievement is exciting (if true). Below about 277 nm, the quantum yield for detected photons in silicon exceeds 1 due to ionization. In the range shown, it will be nominally 2. This is not strictly an increase in quantum efficiency because while the additional electrons generated from ionization increase the signal, they do not improve the shot noise. In fact, the statistical variance in the quantum yield will increase the noise where ever the yield exceeds 1. See "Fano factor". There is nothing strange about the curve but keep in mind that it documents two phenomena. Every photon at 277 nm exceeds Si bandgap by energy by the factor of four. If ionization generates nominally 2 e- (why not 4 e-? ), the internal quantum yield increases. But the quantum efficiency is different and is also a function of separation and collection coefficients for e-h pairs. Just after generation the recombination occurs both at surface traps and in the bulk. These processes are not abrupt in silicon. What is why the UV peak is suspicious. Also UV optimized Si-photodiodes do not show such sharp UV peak. So, this peak is not due to silicon. Only the first electron requires energy equal to the bandgap. After that, generating additional electron hole pairs from the same photon each require 3.6 eV, The minimum absorption depth for silicon is around 254 nm so as this wavelength is approached from above the QE drops because of recombination near the surface as the e-h pairs are created at shallower and shallower levels. Before 254 nm is reached, ionization e-h pairs begin to be generated so the yield begins to rise. At shorter wavelengths still, the e-h pairs from the bandgap become more collectable. Thus the peak. In UV photodiodes, as in backside illuminated CCDs, the surface is prepared in a way that minimizes recombination so the QE curve below 277 nm is flatter and the yield simply rises as the ionization pairs start to be produced. GM, probably its due to the ARC coating used. It may have a sharp transmission at ~260 nm. My guess. Agree that ARC can selectively increase transmission. But silicon at this wavelength has a peak in reflection R>70%. That ARC has to suppress so high R and transfer all UV light to reach QE~75% selectively at 277 nm ! Unbelievable! My guess, the calibration should be double checked. XinYang, it's a nice achievement. By the way, do you use dual conversion gain in your pixel ? What is the CG used to get 1.3e RMS noise please ? Thanks ! 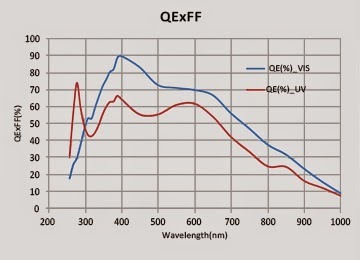 Does the lower QE in the longer wavelength (of the UV optimized) a difference in epitaxy thickness or due to the fact the UV optimized does not have any anti-reflective coatings? Is there any data on the total-dose effects/stability of the UV optimized version?That would be interesting data to have! Anony: There are ARC (stack of several layers) on both BSI sensors, and according to our simulation, the transmission in NIR is good. The lower QE is due to the thin epi since it is even thinner than our standard NIR enhanced FSI sensor. No irradiation data yet. Xinyang, good work from you and your team! Looking forward to read ur coming IISW paper. Xinyang, I hope a summary of that paper will some day be posted here. The achievement is beyond any expectations. Xinyang, is this the dual gain pixel also described (in FSI version) in your last SIE paper ("A 4MP high-dynamic–range, low-noise CMOS image sensor", by Ma Cheng)?